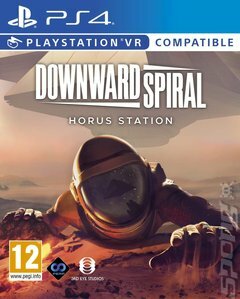 Float into a derelict space station and immerse yourself in a science fiction mystery in Downward Spiral: Horus Station. A first-person exploration and occasional action game, Downward Spiral is all about the immersion. There are no cutscenes, dialogue or text here. You'll need to unpick the mystery with close observation and interpretation. Everything's there in the environment if you look closely. The star of the show is arguably the zero gravity mechanic. With no artificial gravity on hand you're free-floating through the station courtesy of PlayStation VR. It might sound like a recipe for making your stomach do loops, but because you have to move through the station by pulling and pushing on its walls like a real astronaut (PlayStation Move controllers are great for this) the pace is gentle enough to keep your dinner where it belongs. As well as exploring Horus Station you can use ship hardware such as bolt throwers, rail guns and arc welders to disable threats and solve puzzles, though it's possible to play without any enemies around to bother you if you prefer. If you do fancy a faster-paced experience, however, you might fancy trying the PvP and PvE multiplayer modes. Alternatively, more co-operative players can bring in a pal to complete the entire story in co-op mode.